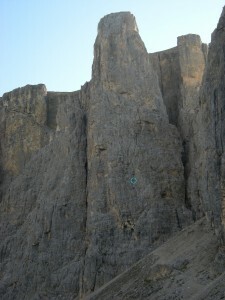 West face of Sella Three Tower, home of the Vinatzer route (Aug. 2008). …which turned out to be two days later as a brief system rolled through South Tyrol. 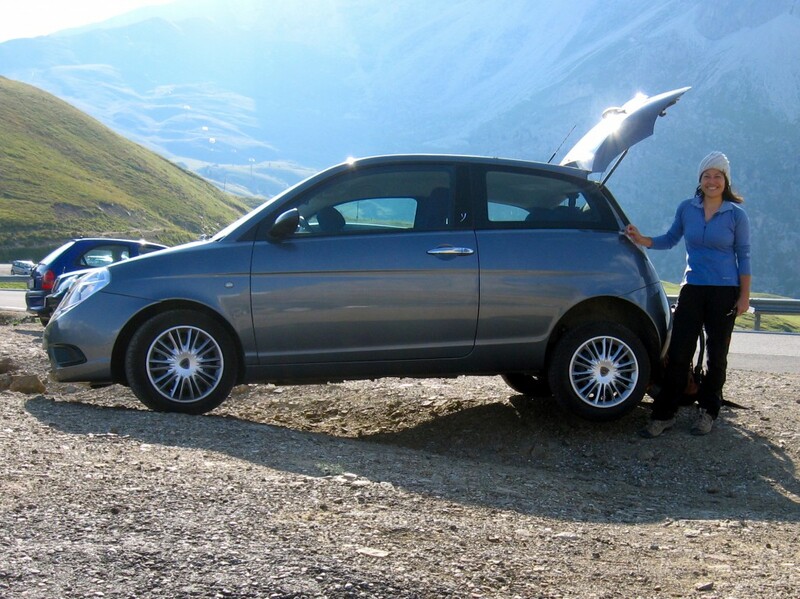 Finally though, there we were at Sella Pass at the crack of dawn. Well almost. 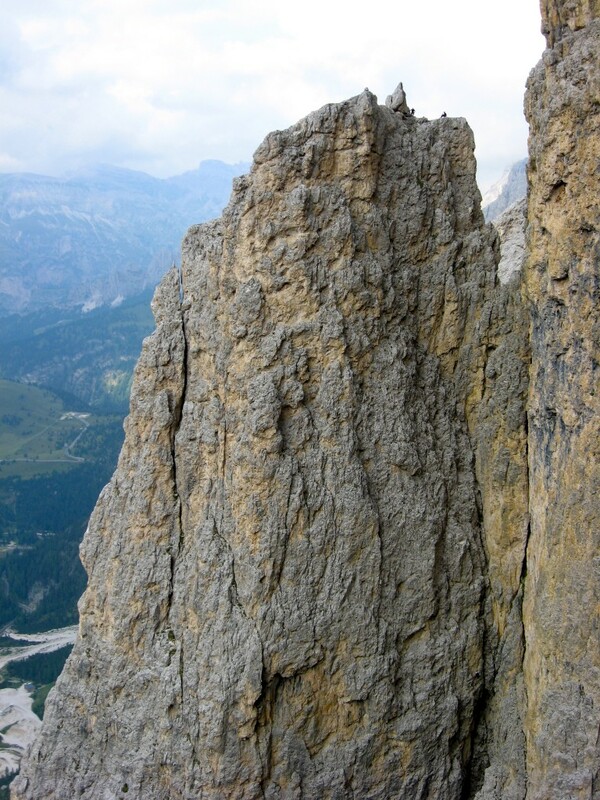 Shirley’s pick for the day was the Third Sella Tower with its nice-looking Vinatzer route. The advertised 20-minute approach followed by 13 pitches of climbing and a tower summit were irresistible. A sizable crowed was already assembled at the base when we arrived though it would prove to not be an issue as most would either be quite fast or would bail after the first pitch or two. The climbing was fun if not terribly sustained. I had this feeling as though I were free soloing given the interesting fixed pegs…a persistent nagging that would take me a few climbs to get rid of. 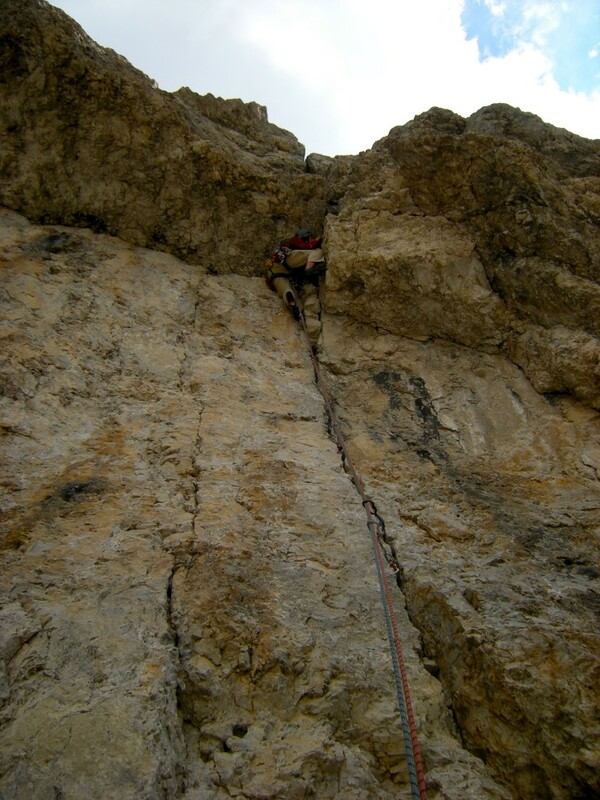 The advertised crux finger crack pitch was probably the highlight of the route. 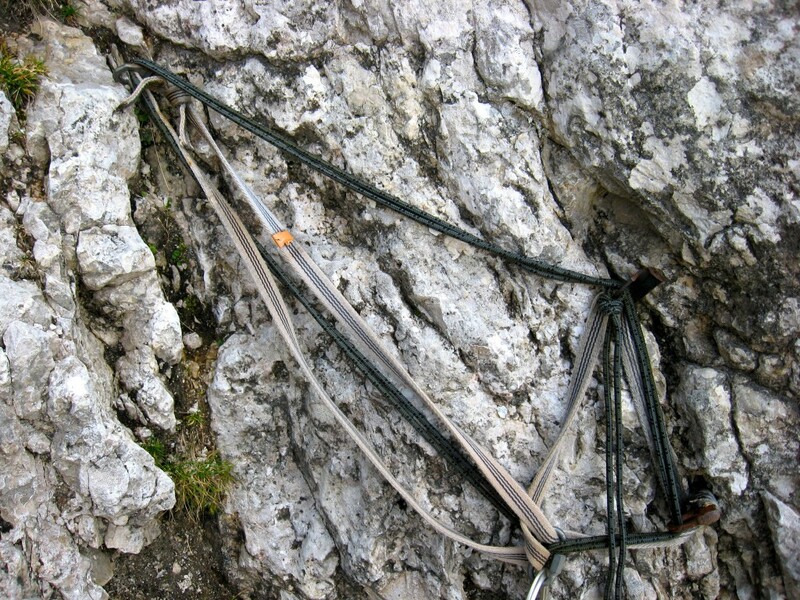 The rock quality deteriorates near the top, at least visually but no holds broke. Soon we were enjoying our tower summit and less so the largely free solo downclimb of the easier “backside” of the tower (exposed and stressful!). 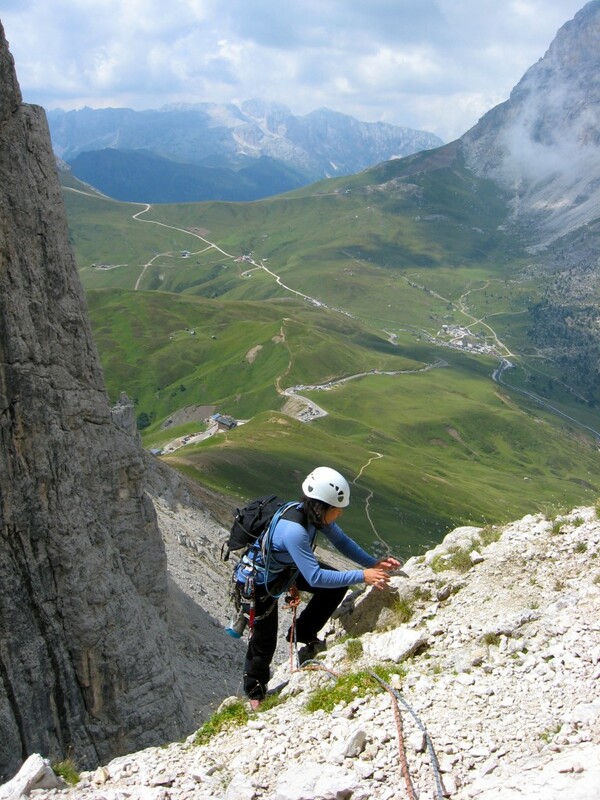 We ran into a trio of friendly Italian climbers and joined forces on the rappels while shooting the breeze with Mossimo. Shirley on the approach to the Vinatzer route on the west face of the Third Sella Tower which is...third from the right. First and Second Sellas are on the right and the Fourth Sella Tower is on the left (Aug. 2008). 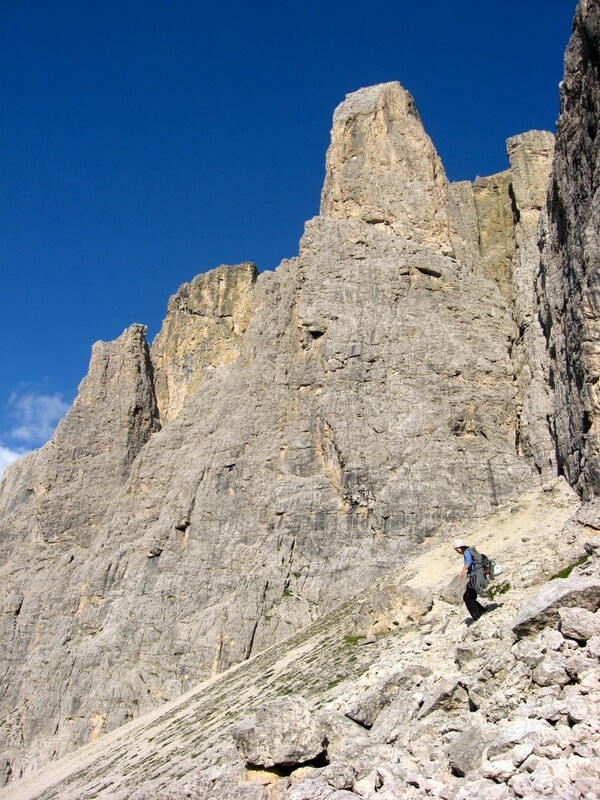 West face of Sella Three Tower, home of the Vinatzer route. In full resolution version, you can see a party of 3 climbers about 3 or 4 pitches up Vinatzer - the guy in circle plus a companion below & above (Aug. 2008). 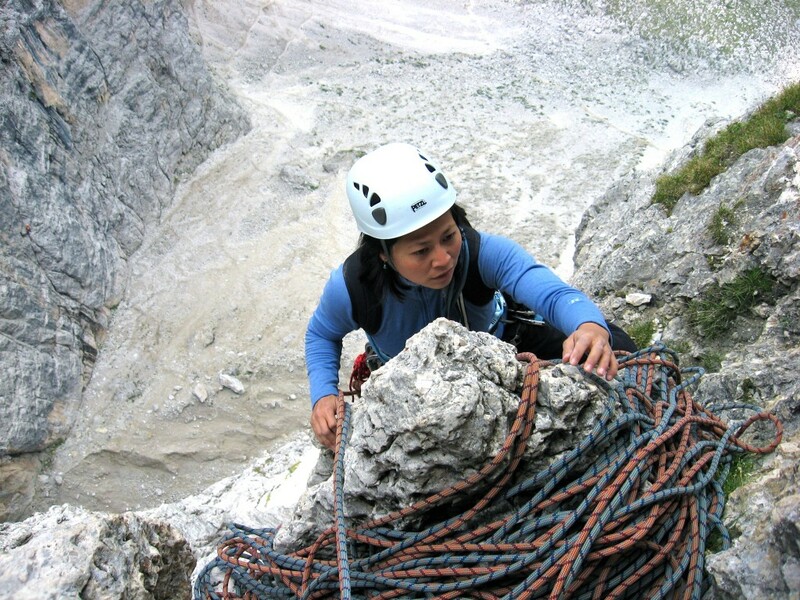 Shirley leading a pitch on the lower half of the Third Sella Tower's Vinatzer/Peristi (V+, 13P) route (August 2008). 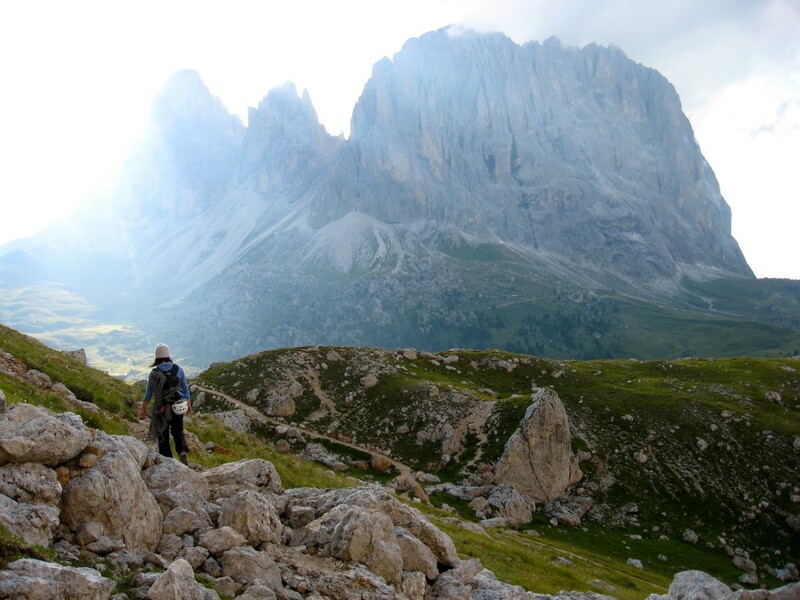 Welcome to the Dolomites. Is what we call an anchor...and we thought the Euro's bolted everything LOL (Aug. 2008). Unknown party (parties?) 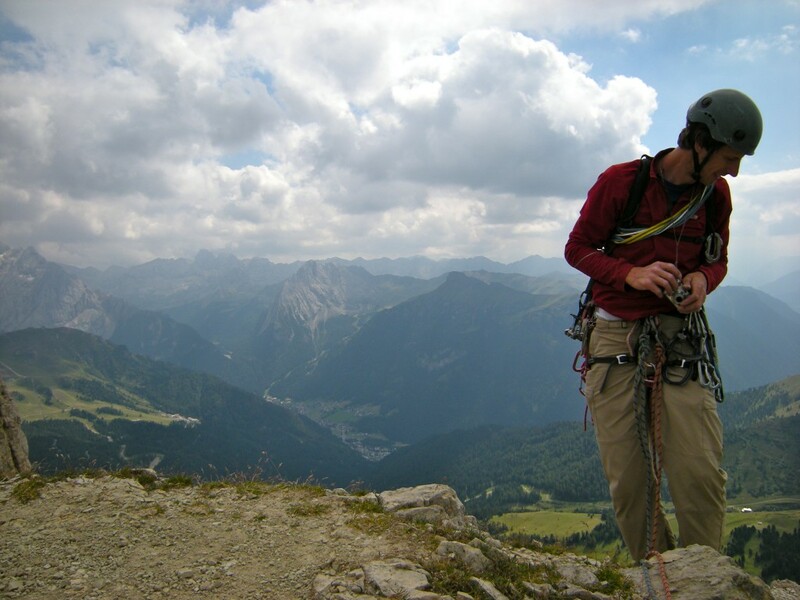 on the beautiful looking Messner route on the north face of the Second Sella Tower (Aug. 2008). I'm guessing this is pitch 5 of Vinatzer (Aug. 2008). More Vinatzer action (Aug. 2008). 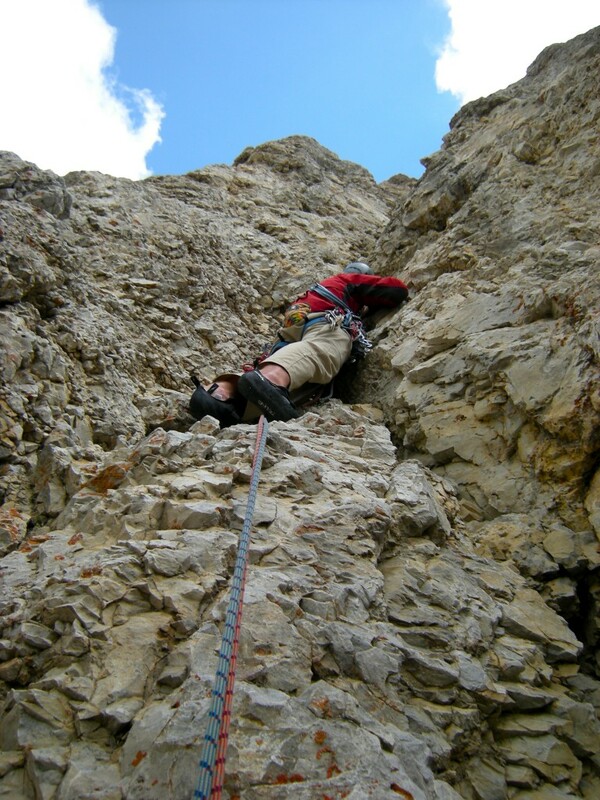 Unknown climbers on the Kasnakoff route on the Second Sella Tower (Aug. 2008). 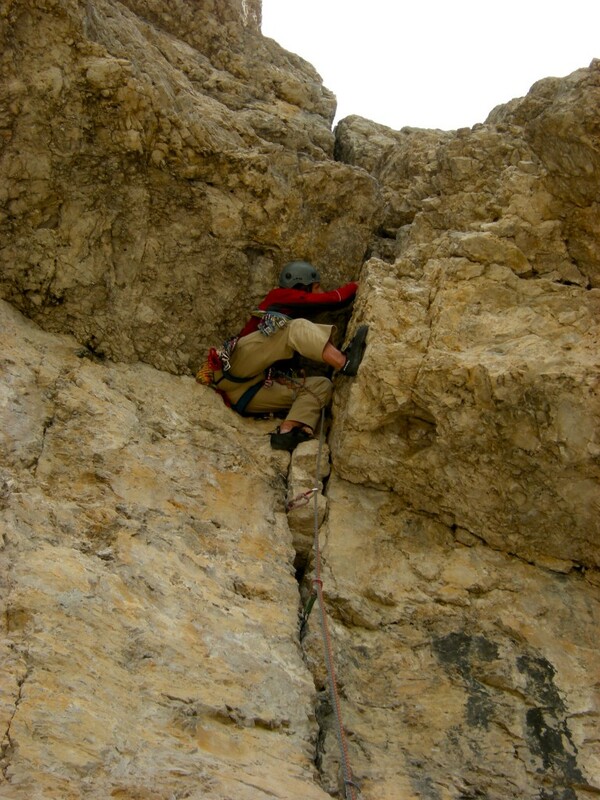 Unknown climbers on the Kasnakoff route of Second Sella Tower (Aug. 2008). 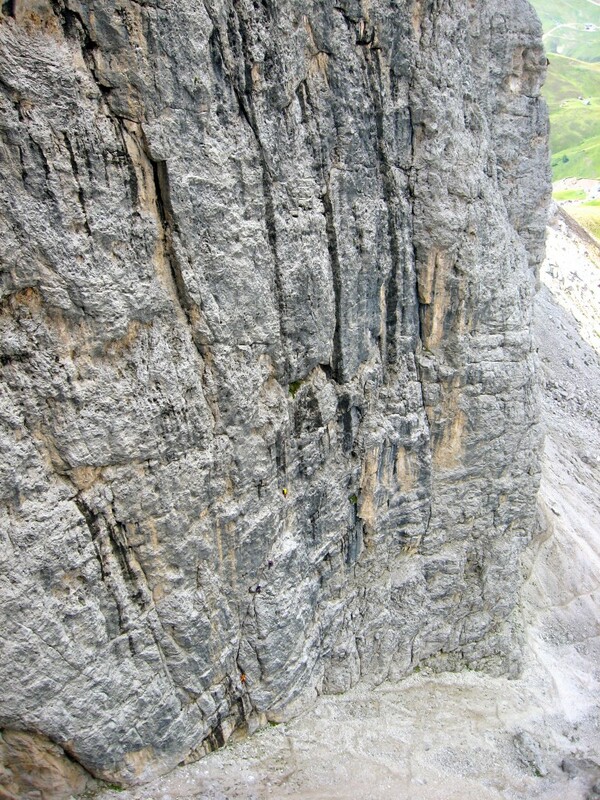 Shirley arriving on huge terrace right below the crux roof of Vinatzer route (pitch 6th pitch) on Third Sella Tower. Sella Pass is down below and Second Sella Tower is on the left (Aug. 2008). 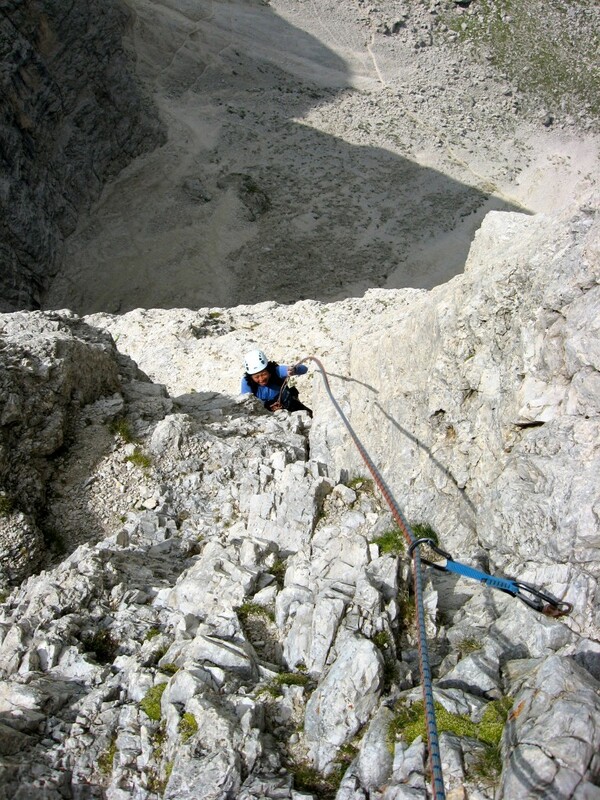 Leading the nice crack on pitch 7 (per Kohler & Memmel guidebook) of Third Sella Tower's Vinatzer/Peristi route (August 2008). 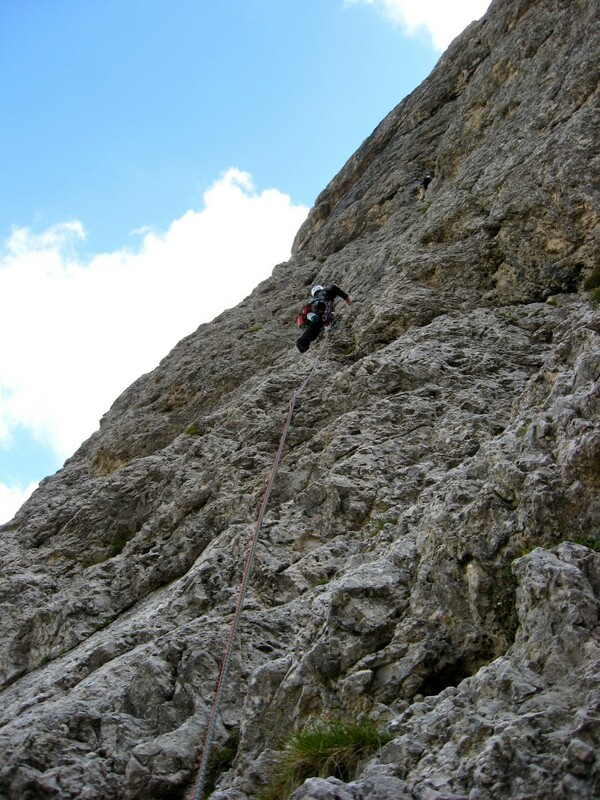 Leading the crux finger crack to roof somewhere midway up Vinatzer route on Third Sella Tower (Aug. 2008). 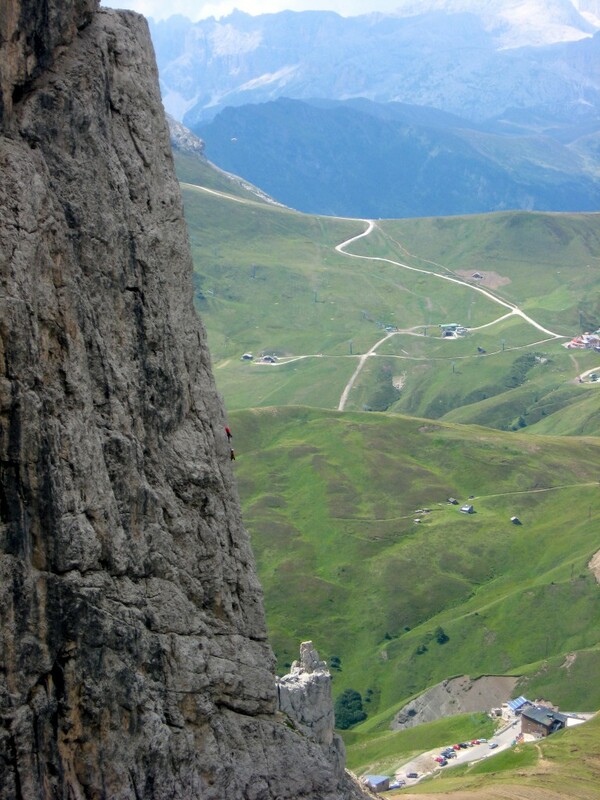 Unknown climbers topping out on Second Sella Tower via its Kasnakoff (V+) route (Aug. 2008). 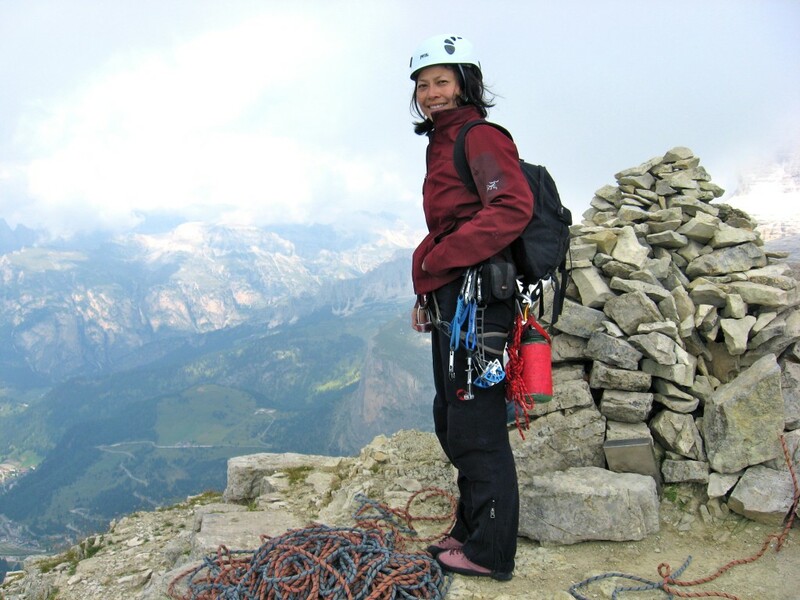 Shirley on the Vinatzer route on Third Sella Tower (Aug. 2008). I think this is pitch 9ish of Vinatzer. Despite the appearance, the rock was solid (August 2008). 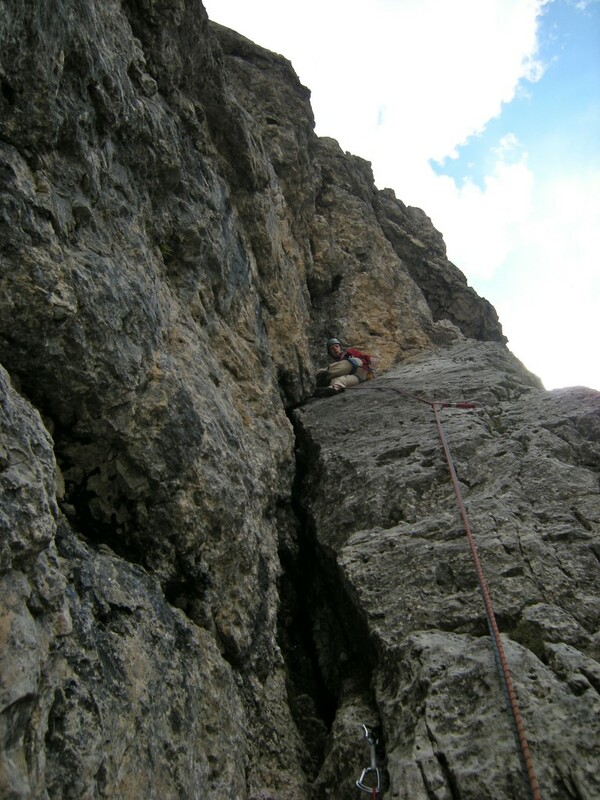 Shirley arriving at a belay high on Vinatzer route of Third Sella. Second Sella Tower is in background (Aug. 2008). 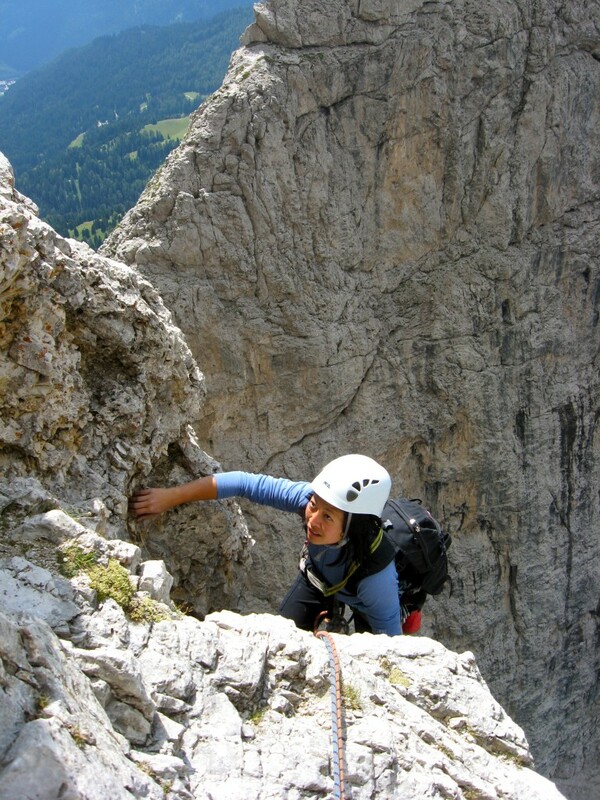 Shirley nearing the summit of the Third Sella Tower via Vinatzer/Peristi (V+, 13P) route. 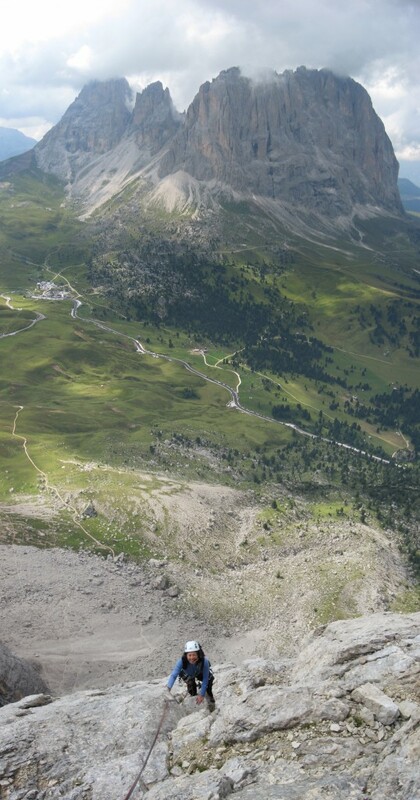 In the background are (L to R): Grohmannspitze, Funffingerspitzen, and Langkofel (August 2008). 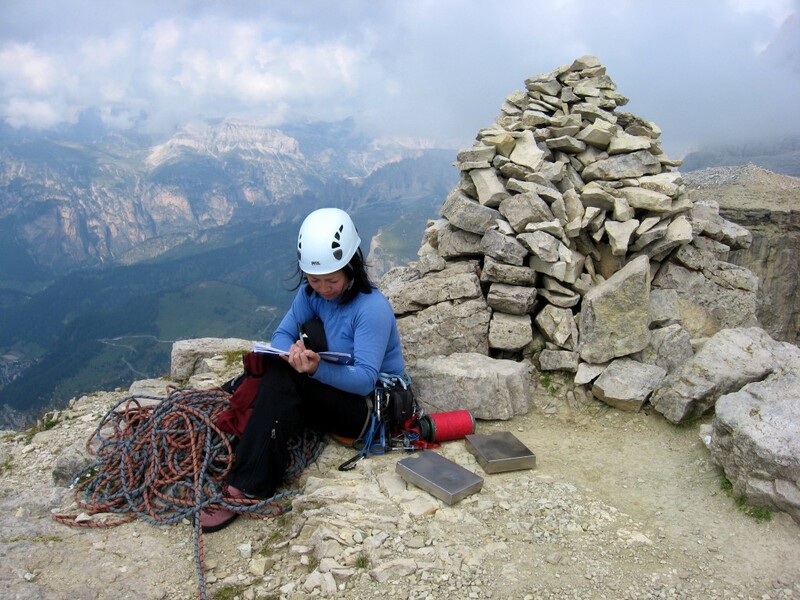 Summit of Third Sella Tower with Shirley scribbling dirty jokes into the register following our climb of Vinatzer/Peristi route (August 2008). On the summit of the Third Sella Tower (Aug. 2008). Ready to start the PITA descent from the Third Sella Tower (Aug. 2008). 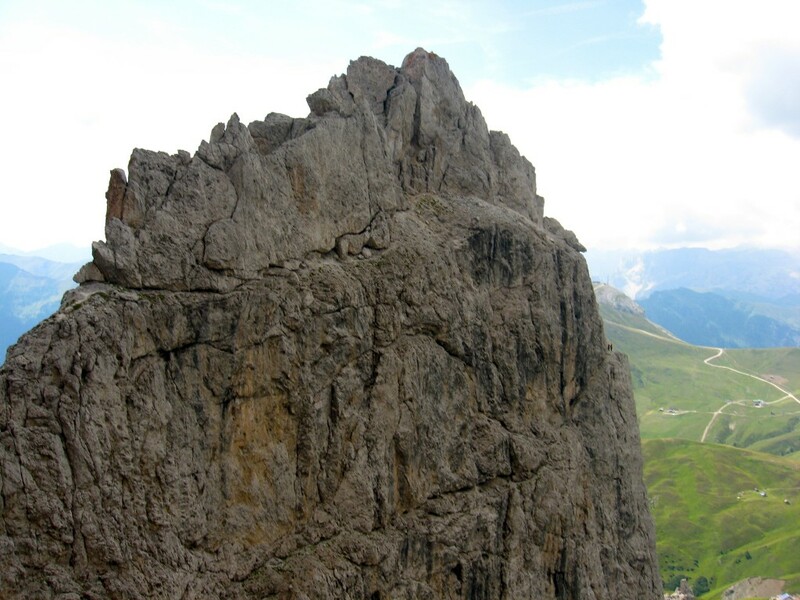 The Fourth Sella Tower with some climbers nearing the summit (Aug. 2008). 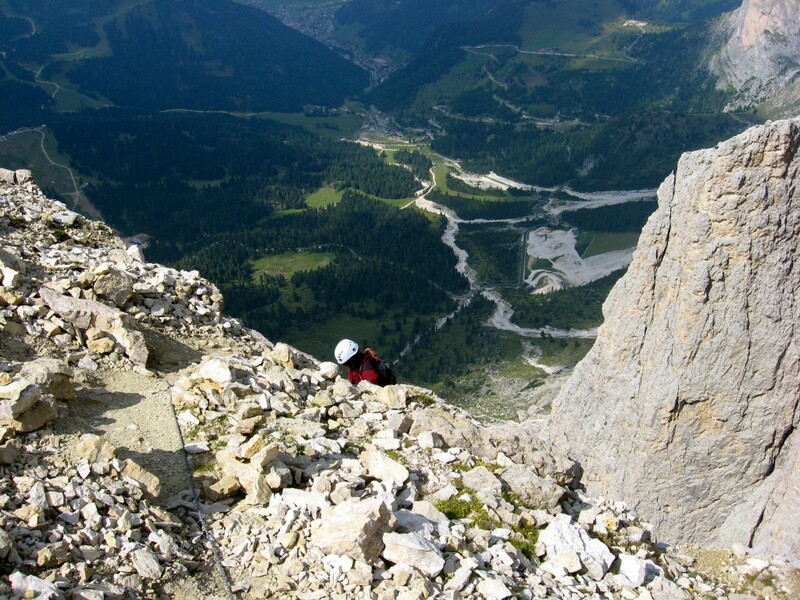 Shirley starting the somewhat sketchy descent from summit of Third Sella Tower (Aug. 2008). 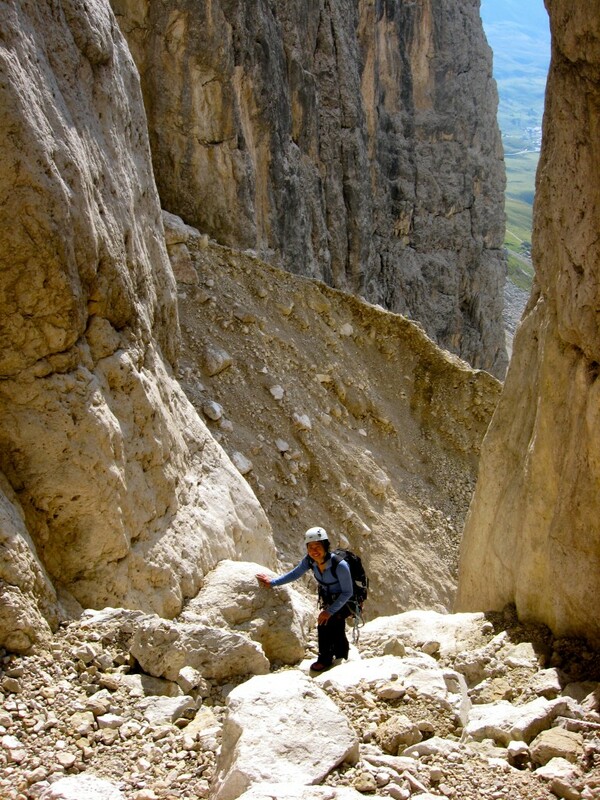 Shirley descending the gully between Second (left) and Third Sella Towers after our climg of Vinatzer on Third Sella (Aug. 2008). 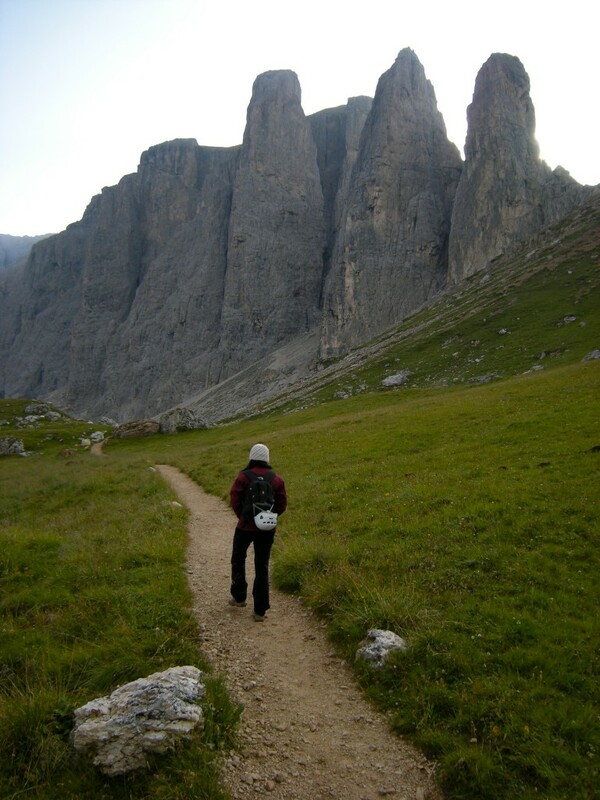 Hiking out after our climb of the nice Vinatzer route on the west face of the Third Sella Tower (in background; Aug. 2008). Shirley hiking down towards Sella Pass after our climb of Vinatzer route on Third Sella Tower. 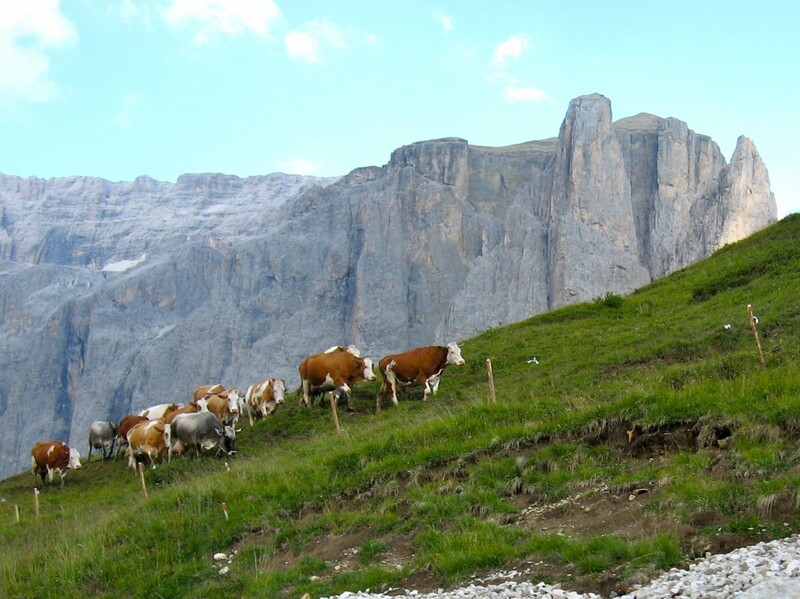 Langkofel is the large mountain in the background (Aug. 2008). 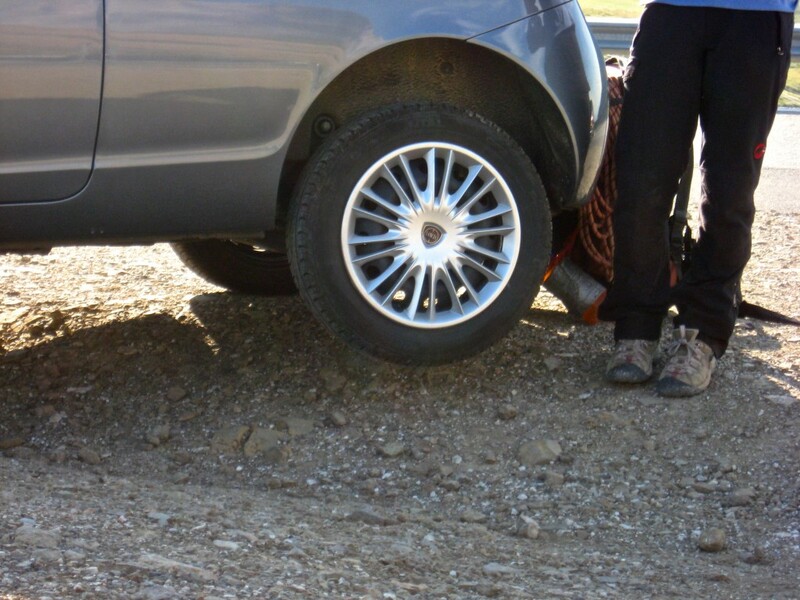 Shirley admiring her parking job (yes, only 2 tires make full contact with the ground) after our climb of Vinatzer route on Third Sella Tower (Aug. 2008). 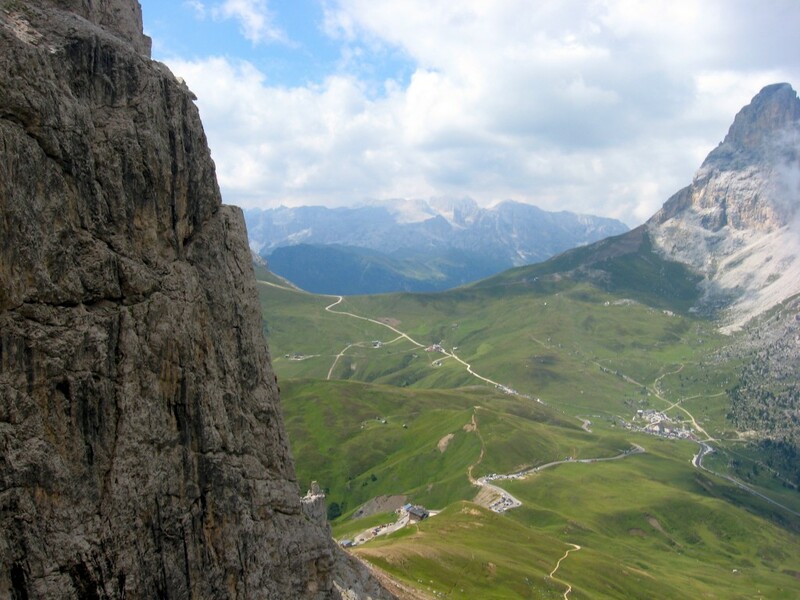 Sella Pass and Sella Towers. The tallest tower structure is the Third Sella Tower. To its immediate right is the Second Sella Tower and to its left (looks well attached to the parent cliff) is the Fourth Sella Tower. Some local pass residents are in the foreground (Aug. 2008).